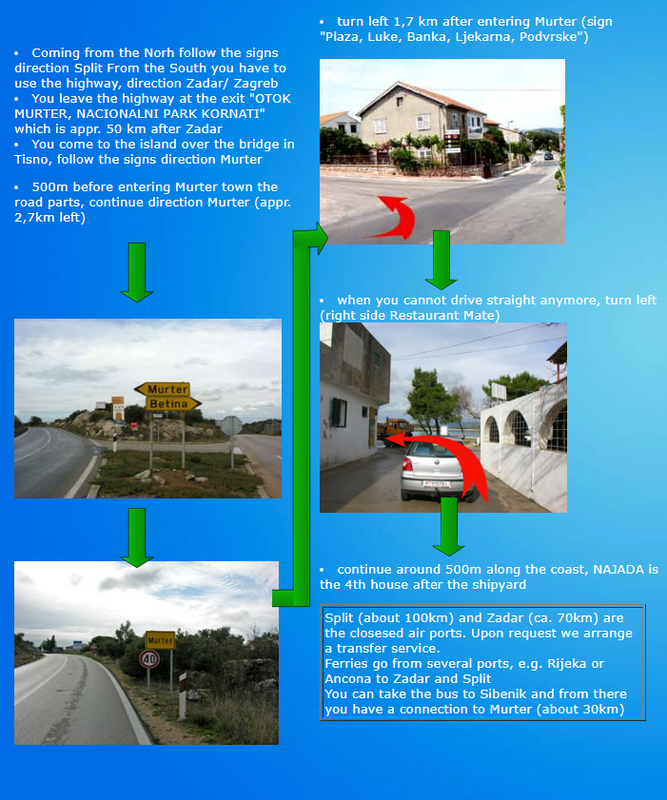 Our dive center in Murter is located directly by the sea, which certainly offers a lot of comfort. The team speaks several languages. 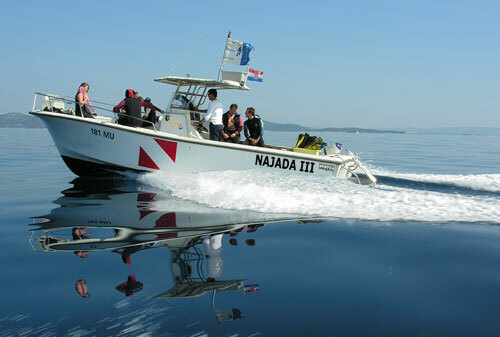 Najada diving is member of the international organisation QUALITY DIVERS, the dive center is ISO certified and has over 15 years experience with diving in Croatia. 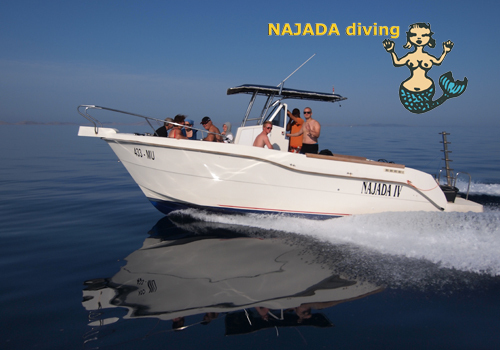 With this short video we want to show you a typical day at Najada diving. For example how the day start with preparations and ends up with a deco beer. ANNA opened the dive center in November 2002 and is still each day engaged in the daily business. You might not see her always in a dive suit, but you find her (at the latest) for apres-dive chat. When the staff needs a break, Anna is diving and driving. BARBARA, our office manager and responsible for a smooth check-in and pleasant stay. No guest will remain without coffee or advice for good shopping & eating! Barbara knows where to go, when and how. In the last years Barbara was engaged in improving our administrative procedures and together with Kurt she has contributed to our on-line check-in form. LEO Is the technical genious: not only is he a trimix instructor and rebreather diver, but he is also able to fix and repair almost anything! Besides teaching, guiding and driving our boats, Leo is in charge of our regulator maintenance. Leo has been with Najada more than 10 years and is representing the management in absence of Anna. 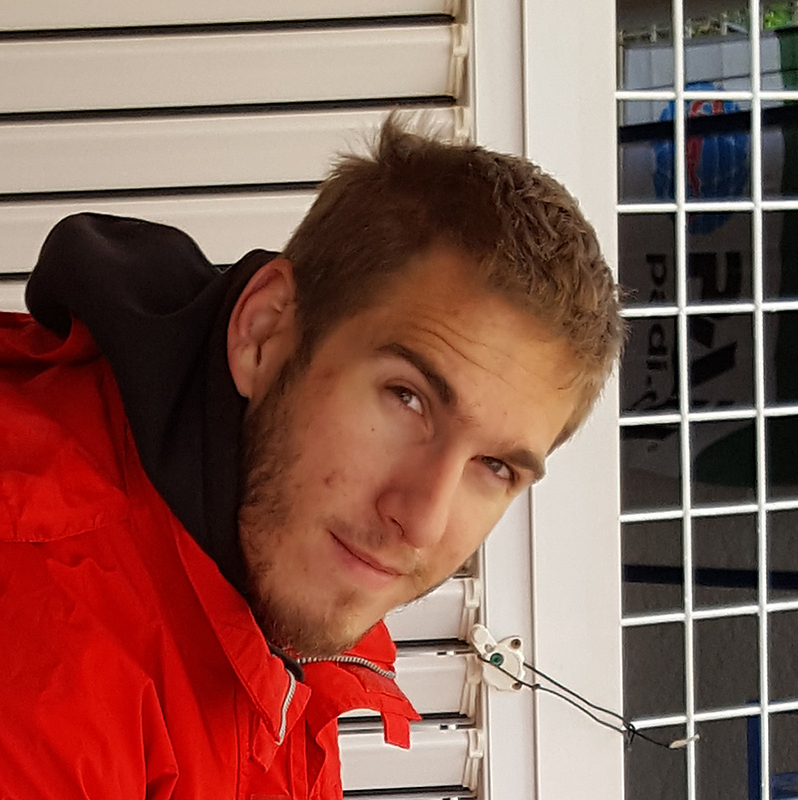 OSKU is our 2nd Finnish team member. 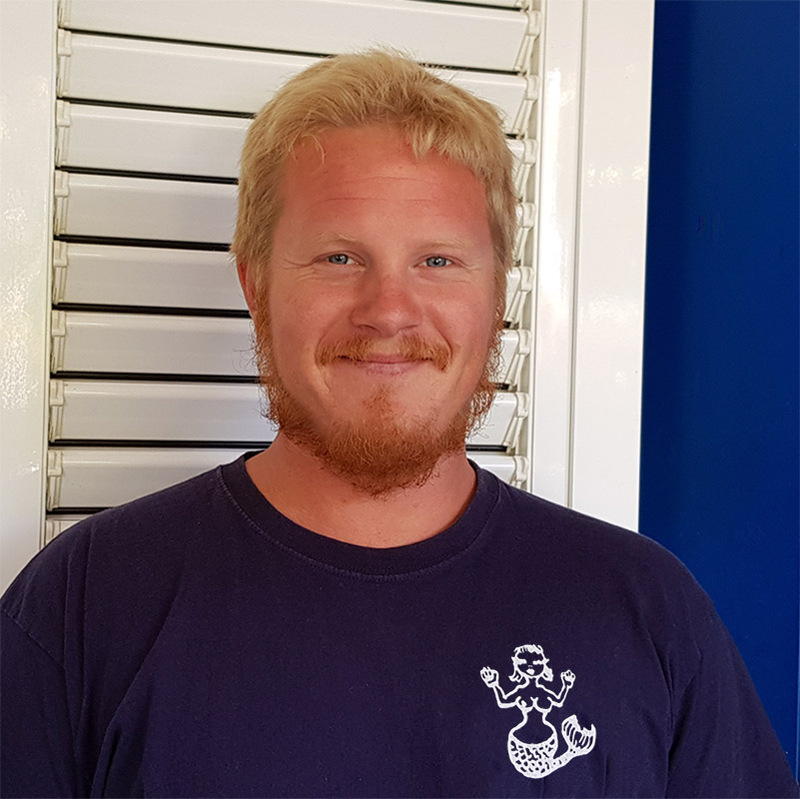 He made a Divemaster Internship with us in 2018 and decided to stay a bit longer. Besides native Finnish and Swedish, Osku speaks fluent English and basic German. He is a good captain and gas blender and shares with us his experience from the past (driving boats, constructing pontons and bridges, underwater works). 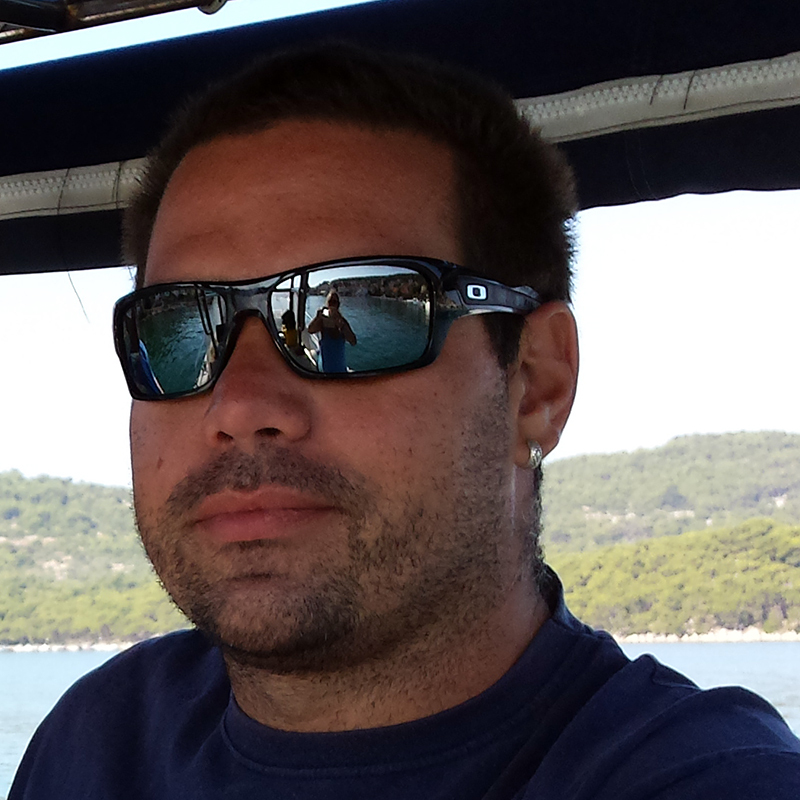 At the moment Osku expands his skills by attending the school for Croatian Skipper and Divemaster. BORIS Takes care of the logistics. Based on a daily disposition list, it is the duty of Boris to make sure, that correct gear is packed on the correct boat. 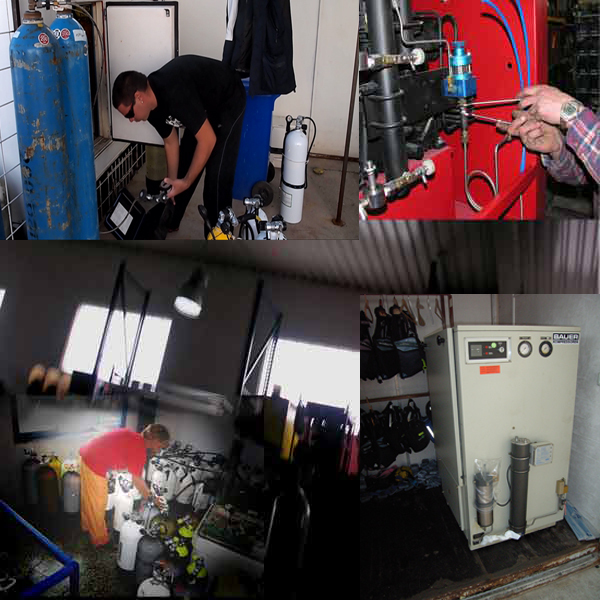 So, as a licensed Gas Blender Boris is not only filling our daily compressed air tanks, but also Nitrox and Trimix mixes. KURT, What would the briefing be without the dive site map made by Kurt! As a keen photographer and skilled artist, Kurt has designed over the years not only the dive site maps, but also produced booklets, that our divers enjoy studying over a “deco-beer”. 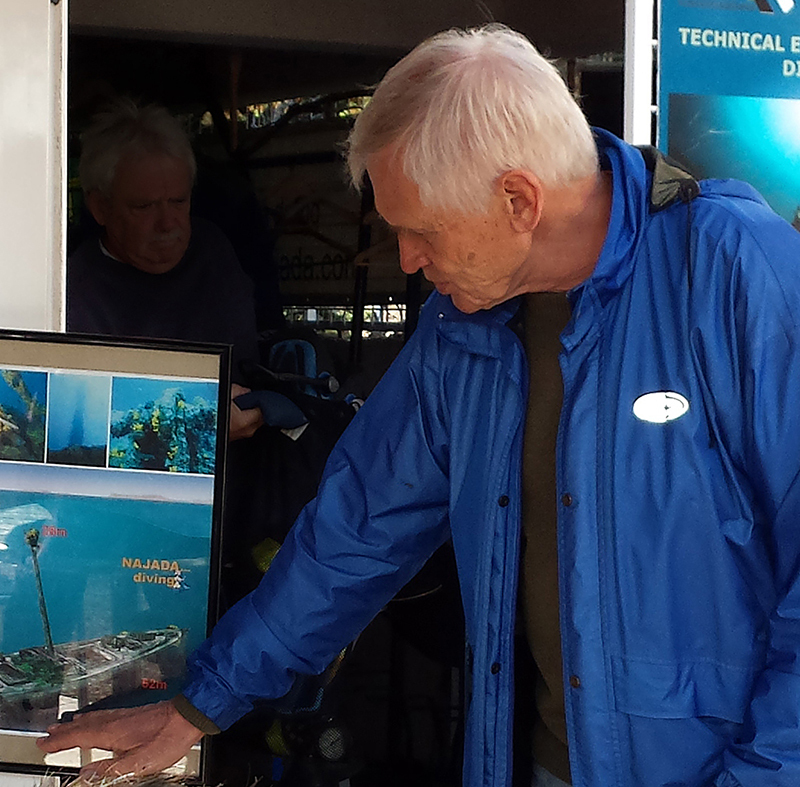 In order to make the formalties easier by check-in, Kurt has designed a dive center management program, here all key data from each diver are to be found. The latest development is a more modern homepage. JERE, a very experienced captain. You can be sure, that you do not have to swim miles to the dive spot. Some of our repeater guests might remember Jere from some years back (with Najada 2007-2012), where his famous answer to the question “Where are we diving?” was “na-ja-da” (which if I translate it into English “well, over there” is not so funny, but the German speakers are laughing.) 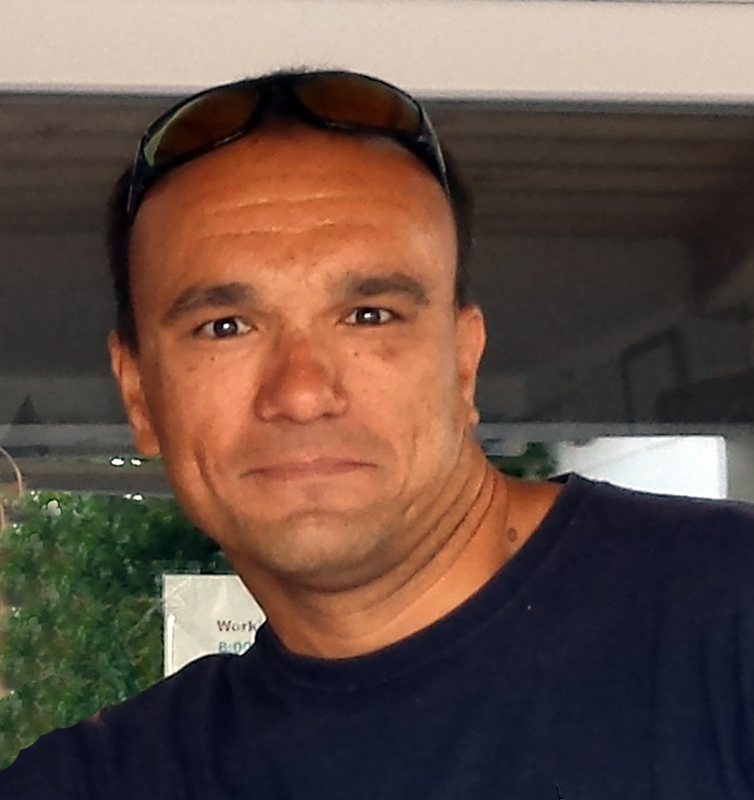 Jere is a Cmas instructor, trimix diver and PADI DM. Jere is certainly skilled in gas blending. TEEMU counts likewise to our fix free-lancers. Being from Finland, Teemu normally takes care of our Nordic guests. 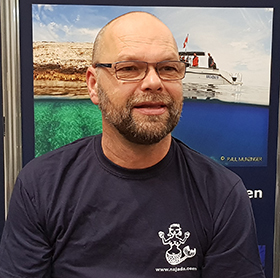 As an experienced Tec diver and Cmas Instructor, Teemu is used to dive with both beginners and well experienced divers. 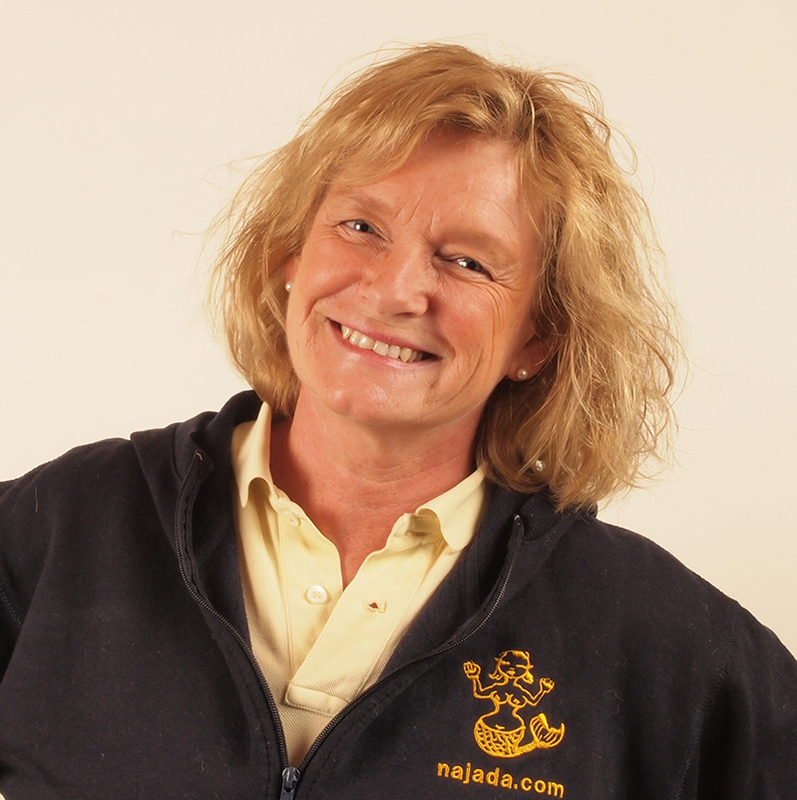 SIGRID – our long-term freelance instructor. Especially the Boat Show in Düsseldorf would be challenging without Sigrid. 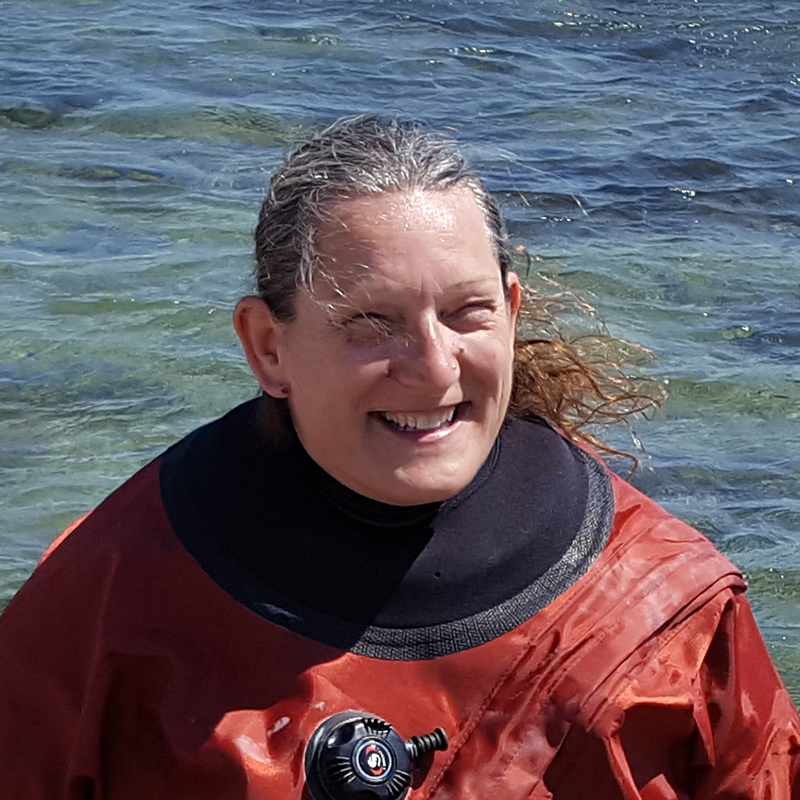 Since 2017 Sigrid has opened her own dive center, offering cooperation services in organizing dive trips combined with education. DAMIR , our Freelanceris a multitalent when it comes to languages. 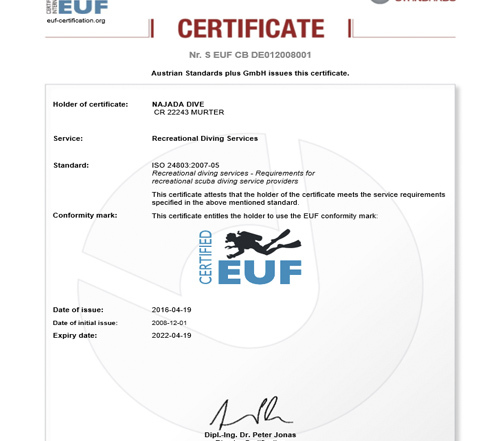 As part of Quality Divers Internal Exchange programs, He has spent 2 seasons in Thailand. 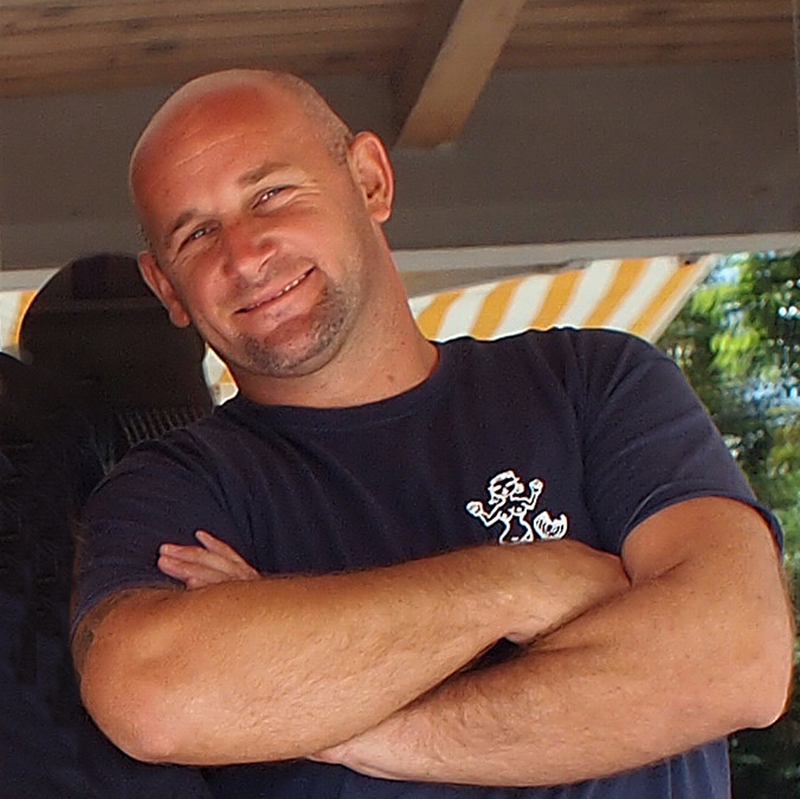 Above all, children love to dive with Damir, but also senior divers appreciate the strong helping hand on the boats. As a skilled Skipper Captain, Damir brings you next to the drop-off, so there is hardly ever a need to swim long distances to the dive site. MEPHISTO, everybody’s darling and really a “spoiled brat“. Most importantly, Mephisto comes to work each day and is happy to perform tricks against snacks. 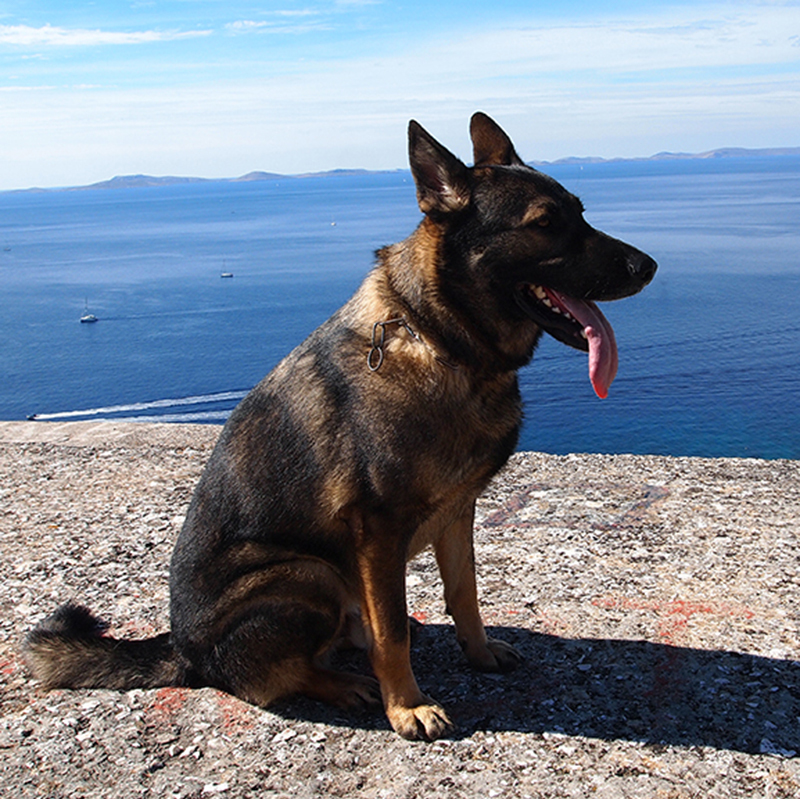 The best days for him are the days, when he is visited by other dogs, mainly from our divers. Since August 2009 we have NAJADA IV. It is 9 m long, can transport up to 10 divers (incl. crew) and has a 320 hp Yanmar diesel engine. The top speed is about 40ktn (approx. 74 km/h). Above all, if we do not exploit this top speed in day-to-day operations, it represents a considerable safety gain in an emergency case. NAJADA IV is equipped with a marine toilet. Najada NAJADA III is 9 m long and has a 260 hp engine. 8 divers (incl. crew) with equipment for 2 dives can be transported. Originally the boat was built for the coast guard, as a result NAJADA III proves its stabiity in extremely bad weather and high waves. A normal cruising speed of 20 knots takes our guests quickly to distant dive sites. In an emergency, where every minute counts, she can reach a speed of 28 knots (approx. 52 km/h). NAJADA III is equipped with a marine toilet. Approximately 100 bottles in different sizes are available. For Tec divers we have a number of double tanks, stages and 10 litre composite tanks that can be filled to 300 bar. We can provide Diluent and O2 tanks to Rebreather divers . We have small 8 litre cylinders for children. The dive center is equipped with three compressors; a Coltrisub compressor with 260 l/min filling capacity, a Bauer compressor with 460 l/min and another Bauer with 280 l/min filling capacity. For technical dives we fill various O2 and He mixes. As rental equipment we have 7mm Mares and Subgear suits with hood, Mares and Apeks regulators, as well as Scubapro jackets. Of course, there are special sizes for children. We are an Ursuit Test Center. Various dry suits are available for testing.